The LG V20 is the first phone shipping with the latest Android OS, Nougat. Today, LG announced its new ~very premium~ phone, the LG V20. It's the first device to come with Android 7.0 Nougat installed, ahead of Google's own Nexus devices. Google typically ships the latest version of its Android operating system with the Nexus line, under which it partnered with hardware makers like Huawei and LG, but rumor has it that the company is killing the Nexus brand in favor, perhaps, of a "Google" or "Pixel" moniker. In any case, Android 7.0 has officially launched for existing Nexus devices, and the LG V20 will be the first new phone to have it. The phone Google is working on won't be announced until early October. 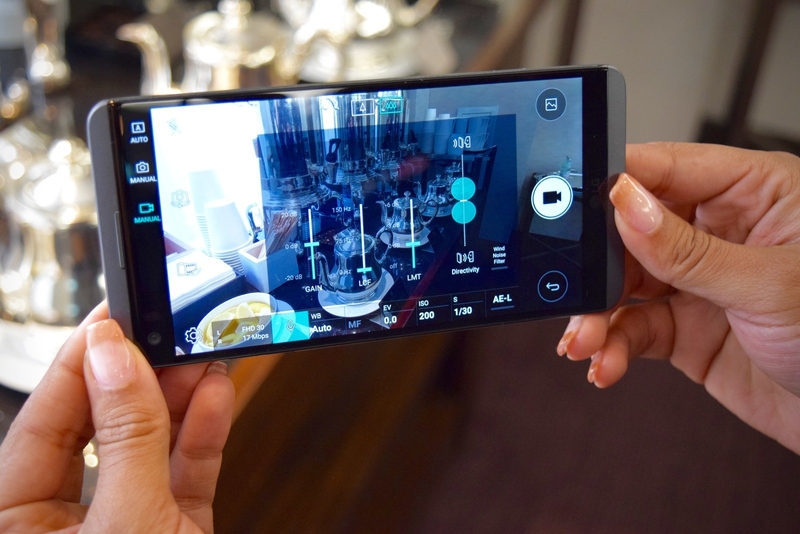 Here's a first impressions hands-on with the brand, spankin' new LG V20, a device that was designed with a focus on high-fidelity video and audio recording tools – and intended to look and feel fancy AF. Android 7.0 has a lot of great features, including multi-window split screen support. The LG V20 phone I tried wasn't set up or connected to the Internet, so it couldn't really show me anything, but setting up the split screen and quickly switching apps was super easy. * A ton of new emojis, including multiple skin tones. * More battery efficiency and power saving features. * New custom quick settings that appear when you first pull down the notification shade. * Quick replies to texts and emails from the notification shade. * Being able to change the size of the font, icons, and interface. * Direct boot, which loads apps before you unlock your device for faster startup. Here's what the multi-window, new emojis, and custom quick settings are supposed to look like. Android N runs alongside LG's own software, LG UX 5.0. LG’s software re-introduces the much-requested app tray that was removed in the previous version and incorporates Material Design concepts, a minimalist design language developed as a guide for developers by Google. The LG V20 has a 5.7-inch display. The phone was designed to emphasize the screen and minimize the surrounding hardware. This phone is basically all screen. It doesn't have any physical buttons in the front. The volume buttons and micro SD slot (for expandable storage up to two terabytes) are on the side and the power button/fingerprint sensor is on the rear (like the Nexus 6P). The V20 is the essentially same size as the V10 released in October 2015. It's slightly taller (by .1mm) and slightly thinner (by 1mm), and the same resolution (2560 x 1440 pixels and 515 pixels per inch). To turn the display on or off when it's face up, you can double tap the screen. Another display update is the larger, always-on "Second Screen" up top. A small section of the display is dedicated to an always-on "Second Screen" that can display information (like the time) even while the device is off; this display requires little energy. And now, this screen is brighter and bigger. The most striking aspect of the V20 is its all-metal build. Last year's model had a metal skeleton too, but incorporated a significant amount of plastic throughout and had a strange pattern on the back. The V20 has a full metal body made of a material called "AL6013 metal," which is apparently a lightweight aluminum used in things like mountain bikes and sailboats. At 174 grams, the device is lighter than last year's V10, thanks to the material (versus 192g). There's a small strip of silicone polycarbonate on the the top and bottom to protect the device from drops. LG is one of the last phone makers to offer a removable battery. Like the LG G5 and V10 that came before it, the V20 has a removable 3,200mAh battery (a 200mAh increase and 20% longer battery life than the V10). The rear plate removal mechanism is pretty slick. There's an eject button on the side that's very similar to one that you'd find on a compact powder makeup case. The battery is charged via USB type-C. The last Samsung phone to have a removable battery was the Galaxy Note 4, and the feature has been slowly phased out of other device lines ever since. There are big technical upgrades to video and audio recording. There are eight new film-inspired video filters to choose from. 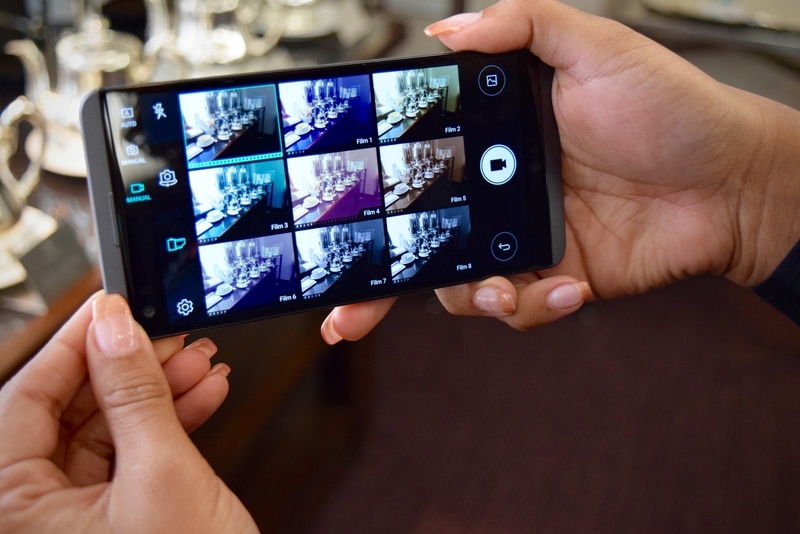 For video recording, the phone features "Steady Record 2.0," which uses a gyroscopic sensor to correct and stabilize each frame of the recorded image. The V20 can also record audio up the 132 decibels, which is four times louder than the V10. In addition to HD video, the V20 now offers more high-definition audio-only recording too. You can choose to record at 16 bit and 48 kHz or a more high fidelity 24 bit and 192 kHz. In terms of photo capture, the V20 now features wide angle mode on both the front and rear cameras. The 5-megapixel selfie camera has a 120 degree range in wide angle mode. There's a new "Auto Shot" tool that can detect faces and triggers the shutter when the face is smiling. There is also apparently some kind of beauty filter because my skin does not look this good IRL?!? The 8-megapixel rear-facing camera offers a 135-degree view. In standard mode, the camera captures 16-megapixel photos. After an hour with the V20, I have to admit: Yes, its metal hardware does make it feel really fancy, and, yes, the new video recording tools offer more fidelity and customization than any other Android device I’ve used. It’s a phone that can capture both high-quality Vimeo videos and quick-and-fun Snapchat Stories. The LG V20 launches in Korea this month, with details on availability and pricing for the US, Europe, and other regions to come. The phone will be available in Titan (pictured), silver, and pink. Stay tuned for more!